Tree heathers fascinate us and this widespread species of southern to northwestern Europe makes a fantastic, drought adapted garden plant. Fine needle like green foliage lines strongly vertical growth. In mid summer the tips of the stems produce many urn shaped pale pink blossoms that are showy for up to 6 weeks. Following the bloom period these remain on the shrub and turn a russet color adding to its charm. To 3′ x 3′ in 4 years. Full sun and well drained average soil with light summer water to establish. Once you have it going it requires no supplemental water. Great for dry areas, gravel borders, hellstrips. Excellent fine textured shrub that develops a shredded gnarled brown trunk with time. Moderate deer resistance. 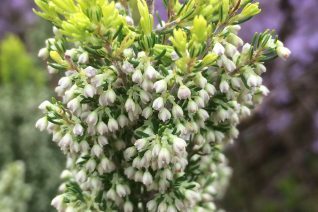 Very cool selection of Tree Heath that has exciting acid green/chartreuse foliage- brighter when new and masses of white flowers that smother the foliage in spring. 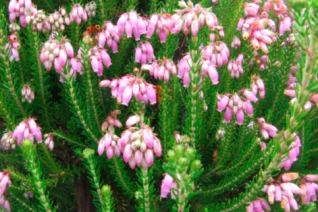 Tough evergreen shrub for full sun and very little summer water when established. To 5′ tall and 4′ wide in 7 years for rich to average well drained soil in full sun with good air circulation. Spent flowers remain on the shrub and morph to a rust color with time- giving the whole shrub a rusty/chartreuse combination of colors. Not for formal gardens. This member of the mediterranean garrigue is drought adapted and cold hardy. Moderately fast growing. Showy in spring bloom.